Our small class sizes allow our faculty scholars and mentors to work one-on-one with students and incorporate small-group discussions and hands-on learning opportunities such as company tours and cultural excursions. Our curriculum is also infused with leadership and personal development programming designed to help you develop skills to turn ideas into practical innovations and to build confidence in your abilities to overcome the most demanding challenges. 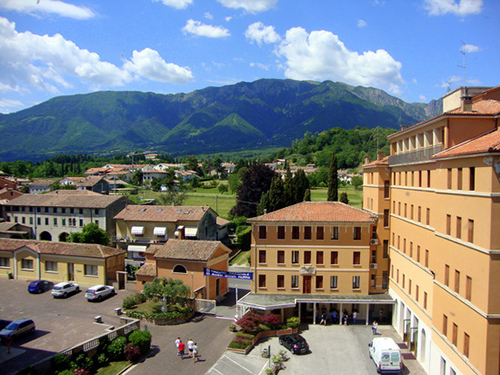 CIMBA (in English, pronounced chim – buh) offers dynamic, personal, and affordable study abroad, MBA, and executive programs in Paderno del Grappa at the base of the Italian Alps in Northern Italy—just an hour north of Venice. For two decades, CIMBA has educated students from 50-plus countries and is proud to have more than 10,000 alumni living and working around the world. At CIMBA, students immerse themselves in a wide range of rigorous courses, including innovative leadership and development programming, while living amidst the Venetian countryside in one of the most popular travel and study destinations in the world. Our students’ business and cultural immersions begin from the minute they step on campus. We share a campus in the heart of Paderno del Grappa with the Istituti Filippin, one of Italy’s top boarding schools where students K-12 are educated. Although our students have different classes and live in different residence halls, they often get to know one another through a host of events designed to build cultural awareness.